Between eight and 10 people have been killed in a shooting at a Texas high school, say police. 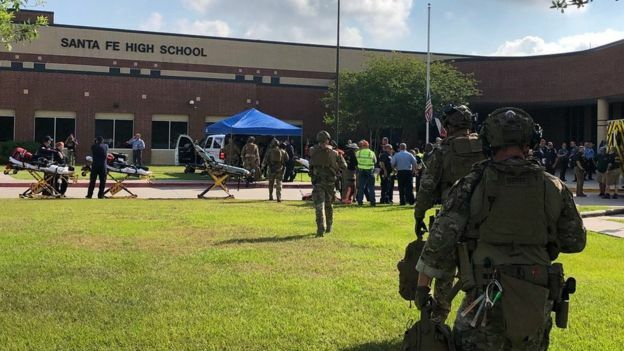 A student is in custody after the attack at the school, which is about 40 miles (65km) south of Houston. That attack left 17 dead and spawned a nationwide youth-led campaign for gun control. The local education authority said "possible explosive devices" had been found at the school, as well as off-campus. "Law enforcement is in the process of rendering them safe. The school has been evacuated," tweeted Santa Fe Independent School District. the district confirmed that people were injured in an "active shooter" incident as classes began on Friday morning. They later added that "possible explosive devices" were located at the school, as well as off-campus. He earlier tweeted: "An injured police officer is being treated, the extent of his injuries are unknown." One witness told KTRK-TV the shooting happened in her art class, and that one person shot was a girl. "There was someone that walked in with a shotgun and started shooting," the student said, "and this girl got shot in the leg." She said that she did not get a look at the shooter, because she ran to hide. One 10th grader told networks she had an asthma attack while hiding in the woods. News helicopters filmed students emptying their backpacks in front of armed officers in a field outside the school. A bomb squad was at the scene, and several helicopter ambulances flew victims to the hospital. Federal officials with the Bureau of Alcohol, Tobacco, Firearms, and Explosives (ATF) are helping the investigation. President Donald Trump, speaking at a prison reform event at the White House, described the attack as "absolutely horrific". "My administration is determined to do everything in our power to protect our students, secure our schools, and to keep weapons out of the hands of those who pose a threat to themselves, and to others," he added. Two weeks ago, Mr. Trump reiterated his call to arm teachers with guns during a speech in Dallas to the National Rifle Association (NRA). First Lady Melania Trump tweeted: "My heart goes out of Santa Fe and all of Texas today."